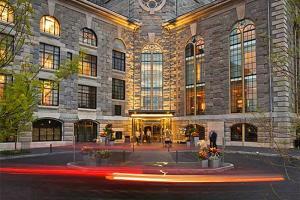 This iconic Boston hotel features a rich history and ornate architecture. The hotel is centrally located just moments away from shopping, dining, and the Boston Common. Guests have direct access to the Charles River Esplanade, perfect for running, biking, sailing, and kayaking. Accommodations include spacious, elegant guestrooms with optional skyline views of Boston including Beacon Hill and the Charles River. Located in Boston, near The Esplanade and antique shopping center in Beacon Hill.